Ketchikan, Alaska - This Sitka Black-tailed deer was lazing in the grass and buttercups in the photographer's backyard Tuesday afternoon. According to the Alaska Department of Fish and Game, the summer coat of reddish-brown is replaced by dark brownish gray in winter. Antlers are dark brown with typical black-tailed branching. 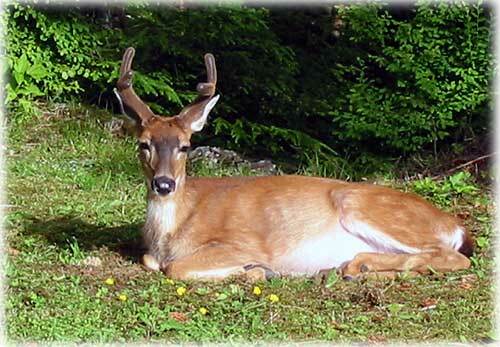 Normal adult antler development is three points (including the eyeguard) on each side.